Dialogue dubbing for Evangelion: 3.0+1.0 has begun. Dialogue dubbing for Evangelion: 3.0+1.0 has begun. 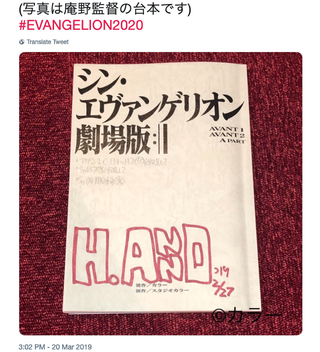 Pictured is a copy of Evangelion creator Hideaki Anno’s script. The movie is slated for a 2020 release in Japan.